My ruby-ncurses says that I have 256 colors, (the constant Ncurses.COLORS). Using some ruby scripts that use escape sequences, I am able to print 256 colors. Does anyone know how to access these 256 colors using ruby-ncurses? 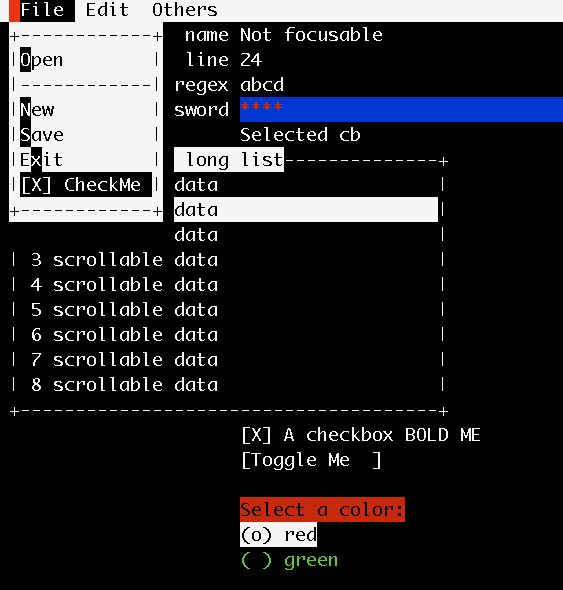 (I obviously do have xterm-256color and screen-256color working on my system for ruby to say 256). Using an escape sequence in the print command of a window is printing the escape sequences, whereas using the same escape sequence (taken from Highline, for underline), in *irb* is correctly printing underline in irb. EDIT: I got a reply from the very helpful maintainer of ncurses (Thomas Dickey) on 256 colors. He says ncurses must be compiled with “ext” option. Also, one can refer to the colors by numbers 1..256. Without recompiling, I wrote a loop and printed colors and saw a few shades of blue. But most other colors looked like they were repeating. I am in no hurry for 256 colors, but thought I would share this. Using this simple line of code, one may maintain a hash containing color_pairs for whatever colors are in use. Whenever, a color is requested, one returns it from the hash , or creates a new one. 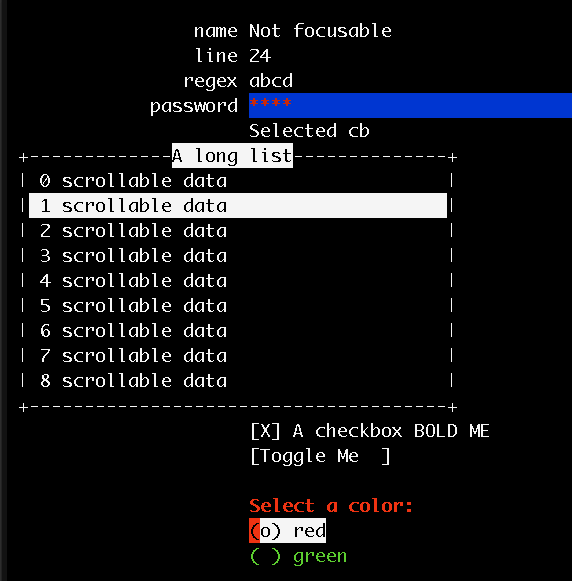 In example 1, the password field has a red foreground and blue background set at startup. “show” means that for every character entered an asterisk will be displayed. Notice also that “Select a color” is cyan, and red and green radio buttons are .. red and green. In example 2, I have checked the checkbox and selected red. The label “Select a color” has become bold and red. In example 3, I have checked our new CheckBoxMenuItem, and doing so has made the label reverse-video. This could help you if you require to map multiple keys like emacs (C-x C-d) or C-x q etc to methods. My first find was manveru’s “VER” which (I presume) means Vi Emacs in ruby. I am using his keyboard.rb to trap keys – helpful in escape combinations and meta-key trapping. However, his excellent keymapper was not what i required in my app, and it was too hard for a newbie like me to understand. What is more, I felt i needed key mapper objects in my application. So I wrote a smaller mapper which takes care of modes, key combinations and regexes. It will work with both keys given as strings, as well as numeric keys. (As i wrote it, I did get back into manveru’s code and use some of it, though). 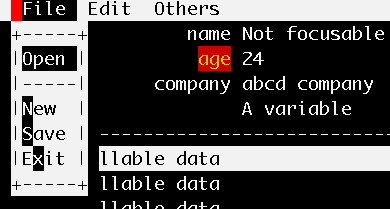 A full-fledged example using mapping defined as strings may be seen in lib/rbcurse/sqlpopup.rb. Here is an tiny example with mappings as integers (as returned by window.getch). Define a mapper object, giving self as handle. Methods to be called are in self. :normal is the normal state of my application, any name can do. I have defined @mode = :normal in constructor. Above, we mapped some double key combinations to methods in self. To keep things simple, no more that 2 combinations may be defined. In the next line, we switch to another mode named “:cx”. Some single key combinations are shown. Note that a method symbol may be passed too. Of course, a single control key may be mapped, and so can a regular expression. We spoke of a mode named :cx. Whatever that is, imagine that once you are in that mode, you can only pres c, a, r and q. Pressing “i” returns you to normal. In reality, this could be linked to an object which only accepts certain keys (say a list). You may (ofcourse) pass your own object/s while mapping and have them passed back. After mapping keys, we can give control to the key-trapping program. This example uses a modification of manveru’s Keyboard, to return integers and not strings. (I am just trying this out to see it’s benefits). In line 2, I allow the mapper to directly take calls. IIRC, manveru’s VER, has a separate handler which then calls the mapper. The keyboard programs calls press whenever a key is pressed, we pass it to the mapper to handle it. The mapper knows that a “C-x” will be followed by another key, so it takes care of combinations. Method or attribute window() that gives the keyboard program the window so as to call getch(). Accessor mode, for getting and changing mode. # keyboard will stop polling and return control if this returns a false. There you have it, with minimal fuss, a means to trap a large number of combinations, and map them to methods. 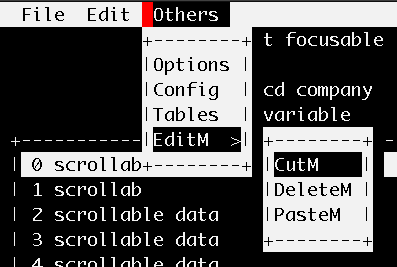 One advantage of binding keys is that bindings can be modified by users. Also, one may query the map object to display all mapped keys to the user. That, of course, looks better if string bindings are used as against integer bindings. 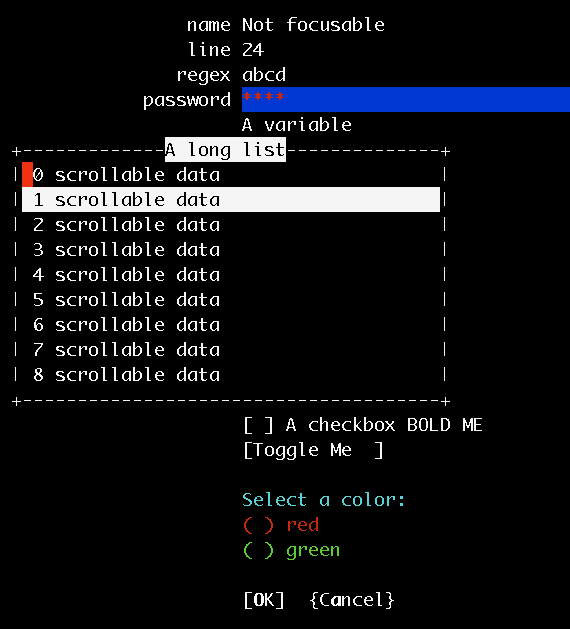 Please check keytest.rb and sqlpopup.rb for running examples. Also, see manveru’s github project for the handler and mapper he has written. I have uploaded the code for RubyCurses onto http://github.com/rkumar/rbcurse/tree/master. Please note that it will take a week or so for the code to be usable, I have not yet saved the form data as yet, only entered and edited. Just some thoughts on ML fields. There are various approaches to doing this that came in mind. 1. python has a sample called textpad.py. This sample places characters that are input onto the window. At the end of editing, it takes the characters from the window and puts it into a String. b. we cannot exceed the size of the window. A simple workaround for this is to use pads. However, again, a pad’s dimensions have to be defined at creation time. So when we run out, we would have to recreate a larger pad. Again the insert/overwrite issue has to be worked around. 2. Using a string: This is the first option that comes to mind. 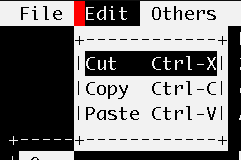 However, inserts and deletes at the start of a long string can be inefficient (I think). Line management could be tricky. 3. Using an array. I opted for this approach and its worked out as yet. Deleting till end of line, deleting lines, inserting lines, joining lines is very simple. However, for critical purposes, or large files it would always be recommended to invoke vim, nano etc. This is intended to be simple and not a word-processor by itself. If anyone has thoughts on this topic, would like to hear. This will give an OK and Cancel button. There are other types for OK, Yes/No, Yes/No/Cancel etc. The “underline” property will underline the given index in the name. Since ncurses underline does not work on my terminal (Highline does), I’ve changed the color. The normal key as well as Alt/Meta key is used as a hotkey. For input dialog boxes, the normal key will be processed by the edit box so the meta key was required. A form takes a window parameter, and manages painting and navigation of its focusable fields. We’ve also tied in a label with the field, so it can put a default location for it. All all properties of a field can be modified at any time. The given name parameter can be used to recall them. This label changes whenever the value of result is changed. The form and fields have events such as ENTER and LEAVE. Notable is the text and command. The name property of widgets is only for recalling them by name. Here we create a label (using a hash, instead of the DSL way for a change). Radio buttons are tied together by a Variable. On selection, the variable contains the value. Don’t flee out of boredom. Just a minute more! I create an array, and then set it in the listbox call. At a later point, i insert some more data into offset 5. Data may be deleted or inserted externally. 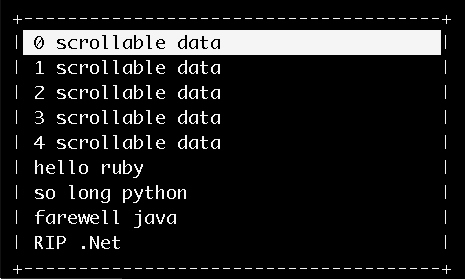 field.insert 5, "hello ruby", "so long python", "farewell java", "RIP .Net"
I have lazily tied the box to the same Variable, you needn’t. Now those configuration screens should be easier to build. texta << "hello there" << "we are testing deletes in this application"
Since my pickaxe had no samples of Tk Menu’s, I pulled out my old Java Swing book from my attic, and implemented menus the way those fellers do. 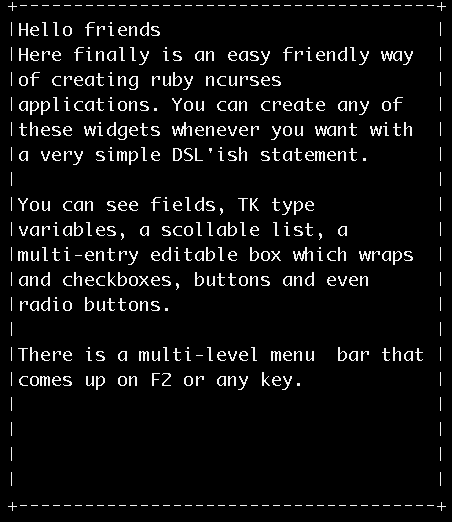 I’ve been working for the last month or two, on an application builder for ncurses, using ruby. I’ve been learning both ncurses and ruby and thus have written and rewritten and refactored my work, so many times …. 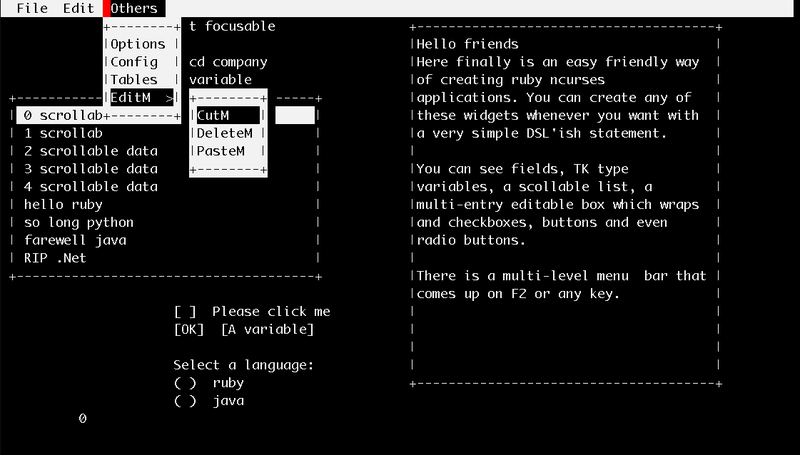 Finally, the other day I thought i would just try out creating a field in pure ruby (on an ncurses window). (Putting aside my 2 months work) In about a couple hours, I HAD a working field. Along with a FORM and navigation etc. All in ruby, you can create the FIELD whenever you want, change all attributes whenever you want … none of the complicated ncurses hassles and sequencing etc. Best of all the code is very small, and one can improve, debug etc it, whereas with ncurses you have to accept what is provided with all its limitations. Don’t get me wrong, I have enjoyed working with forms and fields and even multiline ones, but ultimately even after writing umpteen wrappers every which way, it still was NOT fun. So then I created a label, and then a button. It was quick! All in my hands. I looked up the TK interface in the Pickaxe and made mine similar. In ONE DAY i had all this ready. Got stuck making a menu bar. A single level was easy, but submenus really had me. Took a full day to get that done. That was the hardest. Day 3: Zipped through a message box, then took 5 minutes to extend the button and make a proper checkbox. Took 2 minutes to extend that and make radio buttons!!! Day 4: I made a multiple line field (Textarea) – again tired of the limitations of the ncurses ones … spent quite some time doing word wrapping while entry, editing, deleting etc. This is one of the tough ones that needs a lot of work and testing. You should be able to dump data from outside and write it out and have it just perfect. The current one has no limitation as far as size is concerned. However, with all the situations I am trying to cover, it could be buggy yet. Somewhere in there, i also made a scrollable list box. The whole thing actually comes to two pretty small files, almost no dependencies, looks very much like the “links” browser’s menu bar and message box. These look much cleaner and more profession that what CDK looks like. I am going to start putting up examples, code samples and images in the next few days.